As a Mom of boys I am always on the lookout for good book series that will appeal to boys. It seems like many of the books written for boys are full of potty humor and silliness. I was presented with the opportunity to read and review a new book series called Travels with Gannon and Wyatt written by Patti Wheeler and Keith Hemstreet. It is based on a web series that follows two boys on travels around the world. The books are written as journal entries that alternate between the boys. So far, two books have been published, Botswana in May 2013 and Great Bear Rainforest in October 2013, and another is due to be released in January 2014 called Egypt. 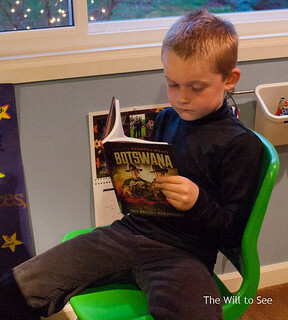 Jack, our eight year old son, has read with us the first book, Travels with Gannon and Wyatt: Botswana. It is a little bit of a stretch book, but he has really enjoyed it. I interviewed him about the book and here is what he had to say. Yes, I liked that it was an adventure and mystery combined together. What else did you like about the book? I liked that kids are trying to solve the mystery and save the lioness in Botswana. It was fun that it was written as a journal and both boys tell the story from their point of view. I like that they use real photos instead of drawings to relate to the story. Did you relate to anything in the book or the characters? I related to Gannon more, because he has more questions about the people he meets. What do you think about characters that are real kids that travel to real locations? I like it more because it makes the store feel more real. You can tell the kids have been to these locations because of how they describe them. I like reading stories that use real locations as part of the story. Would you recommend these books to your friends and what would you say? Yes. It is an adventure and mystery book. Gannon and Wyatt are two boys that travel around the world to help solve mysteries and have adventures.